By the time you read this, Gatwick Express will have operated its very last train, the 01:25 arrival at London Victoria. But not to worry, all trains, staff and operations immediately transfer to Southern, and nothing much will change in the short term. That is, until December this year, when the scheme to overcome crowding on the Brighton Main Line will be implemented. There'll still be trains running non-stop from London to Gatwick every 15 minutes, and for most of the day they'll still use the same trains. 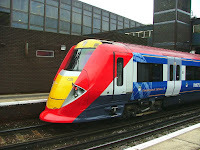 The different comes during each rush hour, when the current fleet will be substituted for longer, higher capacity trains which will run through to Brighton and various other stops south of Gatwick. These trains will have enough seats for 500 commuters in addition to the 100 or so airline passengers you'll currently find on the average Gatwick Express service. These extra trains have been sitting idle since South West Trains displaced them during a fleet reshuffle last year. They're being refurbished with new seats and extra luggage racks and double width internal doors, but will still have narrow external doors. They'll lose their distinctive "snug" area in the buffet car. Are they going to keep the ridiculous 2-tier pricing system? Vic-Gatwick single is about twice as much by GatEx as by Southern. No wonder GatEx tell people to board first and pay on the train. When offered the choice at the ticket office (and had it explained that the time difference is minimal), a lot of people go for Southern. London Bridge to Gatwick has 3 fare bands: "Southern only" @ £8.50; "FCC only" @ £8.90 and "Not Gatwick Express" @ £9.00. Needlessly complicated and confusing. That was pretty much exactly what I was going to ask, too. Surely one reason why the Gatwick Express is so underutilised is simply that nobody who goes to Gatwick regularly ever uses it. The fare difference is even worse if you have a valid railcard, the time difference is only about five minutes, and the Southern service runs all night while the Gatwick Express doesn't. It will be interesting to see how they now cope with the "Buying a ticket to the next station past Gatwick will be cheaper" issue if they don't lower the fare. Installing ticket barriers at Gatwick might be necessary to collect fares properly, but ticket barriers are a nuisance at airports. Sydney airport in Australia has this precise issue. (Tickets to the airport are much more expensive than tickets to stations further down the line, despite the fact that you are on the same train). The resulting ticket barriers are one of the many things about that train service that pisses off potential passengers. It appears that a Standard Open Single (route Gatwick Express only) from London to Gatwick costs £17.90, whereas a Standard Day Single (route Any Permitted) to Three Bridges costs £15.40. In fact, you can buy a SDS (route AP) to Hassocks and still save money (OK, just 10p), and no, there is GEx SDS from the airport.